Discover the practice routine of one of the most respected trumpeters on the European scene. Learn how to increase endurance and improve flexibility up and down the instrument using Gerard's exercises and techniques. 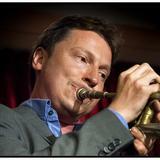 Gerard Presencer is one of the most respected trumpeters around. After an early break playing on one of the biggest-selling jazz records of the 90's (US3's Cantaloop), he's gone on to play with Sting, Chick Corea, Ray Charles and many more. As a band-leader he's released four acclaimed albums, and as an educator he's been Head of Jazz Studies at the Royal Academy of Music in London and Head of the Brass Department at The Jazz Institute in Berlin. Gerard is a self-confessed trumpet geek! In this course, you'll get to spend a few hours with Gerard as he shares his own set of exercises and the daily practice routines that have helped him increase his endurance and improve his flexibility up and down the instrument. He'll explain the methods he uses to make the physical act of playing the trumpet as easy and relaxed as possible. By the end of this course, you'll understand how articulation, single tonguing, and breath accents are there to support your constant flow of air,to keep a relaxed legato feel to playing, but with a good sense of groove steering clear of brute force. This course is for any style of trumpeter who's interested in a technical approach to rhythmic music playing (styles of music that normally contain drums and amplification, where trumpeters can often struggle to be heard, so bad habits can often develop). Over the past 25 years Gerard Presencer has carved out a formidable reputation as one of the most respected trumpeters on the European scene. He exploded onto the international scene, aged 18, when US3 asked him to play the solo part on Blue Note’s Cantaloupe Island (re-imagined as Cantaloop Flip-Fantasia), that became one of the biggest selling jazz records of the 1990s. Since then, he has performed with a who’s who of international jazz artists, and continues to push himself and his instrument, moving outside his comfort zone in order to develop as a player and writer. In other genres, Gerard has recorded as a session musician with artists such as Sting, Jamiroquai, Zero 7, James Brown, Ray Charles, Joni Mitchell, and Jonny Greenwood. Gerard has also been an essential member of Charlie Watts’ various jazz groups over the last 25 years, touring the world and releasing several albums in various groups with the jazz-loving Stone! As an educator, Gerard was Head of Jazz Studies at the Royal Academy of Music in London from 1999-2010 and currently is the Head of the Brass Department at The Jazz Institure in Berlin.